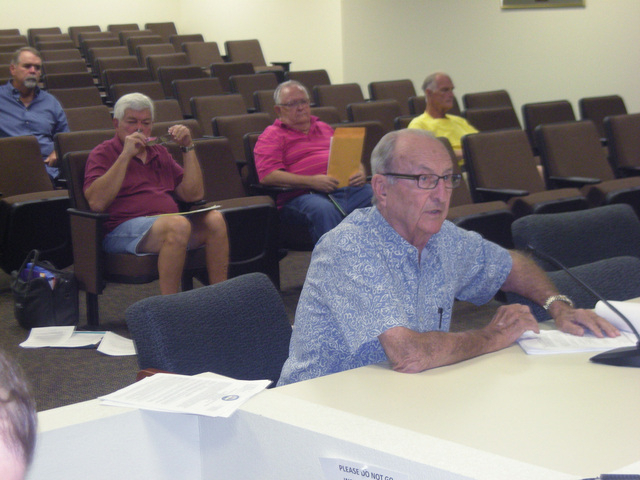 The fallout continued Monday at a Nye County Water District Board Monday after a joint meeting with county commissioners and State Engineer Jason King Sept. 17 over plans to curb water use in Pahrump Valley. Echoes are still reverberating from a workshop King held at the Bob Ruud Community Center last October in which he warned Assembly Bill 419, passed by the 2011 state Legislature, allows the state engineer to designate a groundwater basin a critical management area if withdrawals of groundwater exceed the perennial yield. If a groundwater basin continues to exceed the perennial yield for 10 years and there’s no groundwater management plan drawn up, the state engineer has the right to permit water rights by the priority date. At the Sept. 17 workshop, King said he expected Nye County would have already started drafting a water management plan for the Pahrump Basin, where the state estimates there’s 12,000 acre feet of recharge to the aquifer and 62,540 acre feet of permitted water rights, not counting another 11,106 domestic wells with a potential for another 8,500 wells. He said the impact of 19,500 homes that could be built on permitted subdivisions would be more detrimental, adding 46,000 people to Pahrump’s population. He advocated controlled growth. Tim Hafen, a Pahrump resident since 1951, a former state assemblyman and developer of the Artesia and Cottonwoods subdivisions, begged to differ. “You can demonize the domestic wells yes. But he kind of demonized the developers with the smaller lots who use 150 gallons per person,” Hafen said. He said residential water users of Pahrump Utility Company in his subdivision consumed an average of 260 gallons per day, one-fourth of the water amount the state engineer calculates. Some domestic wells have started flowing again after cotton production in the Pahrump Valley ended in 1982, Hafen said. Nye County Water District General Manager Darrell Lacy said hopefully scientific work the county is working on will enable them to sit down with the state engineer and get a figure closer to the correct number. There have been estimates the recharge could be 19,000 acre feet. The release of a final Nye County water supply appraisal investigation report by Glorieta Geoscience that will be presented to the U.S. Bureau of Reclamation provided fresh fuel for arguments. The exhaustive study included projections of future water use, data on water systems in Nye County and recommendations for dealing with future water supply issues. Water board members were told to provide comments by Oct. 17. “As I read this information I was reminded we have the potential of 495,000 people in this valley with the land divisions in the valley we have right now. I have to wonder why we’re allowing any more divisions period. I’m probably going to get shot for that,” said water board member Donna Lamm, a member of the Amargosa Conservancy. Water board member John MacLaughlin wanted to know how much underlying water is held by the utility companies that may not be used for a long time in the future. The water board has had a standing item on its last few agendas to consider recommendations to curb water use in Pahrump Valley, based on suggestions by the state engineer. They include controversial steps, lots that are parceled up may be no smaller than five acres, if they are on land zoned for single-family residential that’s outside of a utility service area. Another provision would require the relinquishment of three acre feet of water rights, instead of two acre feet, for each additional parcel created not inside a water service district, which would be relinquished to the state engineer’s office. Hafen objected to a plan to require a water impact report for properties outside a water service district. The requirement may be waived if the Nye County Water District staff finds it’s not necessary. It would be required to be prepared by a qualified engineer and must include methods of disposing sewage, controlling water pollution, ensuring the quality of water and providing facilities for water supply for the proposed development.